These beautiful spinach nests are made easy by wilting the spinach first, then forming into small nests before baking with a center of creamy Philadelphia Cream Cheese. Preheat oven to 300°F. Place half of the spinach in water and salt in large saucepan; cover. Cook on medium heat 5 to 8 min. or until spinach is wilted, stirring often. Remove spinach with tongs; drain in colander. Repeat with remaining spinach. Cool slightly. Mix spinach and onion; divide mixture into 6 portions. Squeeze out excess water. Using your hands, form little "nests", making small indentation in center. Place nests in baking dish; place 1 cream cheese piece into center of each nest. Sprinkle each nest with cooked, crumbled OSCAR MAYER Bacon before serving. Spinach has dirt and grit in stems and leaves. To clean, fill sink with cool water and add spinach. 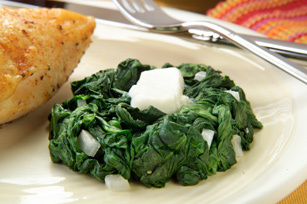 Lift spinach out of water and shake off excess water. Drain sink and repeat. Never cook spinach in aluminum pans. It will discolor and have an off-taste.